Guys, over on Twitter I've been retweeting a specific post all day. It's from U.S. Representative Steve King (R-IA). Who is pretty much a known right-wing straight-up racist. Today he tweeted a statement that has left many individuals and news outlets in a state of confusion and outrage. Read that last sentence again, and again. My Precocious Daughter - my blue-eyed, blonde, 10,000% American child - is the product of immigrants from five countries. She is the descendant of German, Polish, English, Italian, and Irish people who came to America for a better life. She is NOT "somebody else's babies." She is currently dating an outstanding young man whose family emigrated here from Colombia. He was in middle school when they arrived in Texas. At the time, he spoke not a word of English. He is currently ranked second in their junior class. He and his parents are among the sweetest, smartest, warmest people I've ever met. He is NOT "somebody else's babies." impeccably in English, but on Facebook he communicates with his Nigerian friends in a patois that is basically unintelligible to me. It makes me so happy that he embraces both cultures while being a genuinely decent, nice person to everyone. He is NOT "somebody else's babies" (nor are his children). Rep. King, you are quite simply wrong when you state that this country needs to be "restored." We are fine. We are strong. We are evolving, despite efforts by you and your ilk to pretend we are not. Also, you are incredibly ignorant if you believe the majority of Americans are somehow "pure" and not the descendants of immigrants from all over the globe. My ancestors totally did not sail here aboard the Mayflower, nor did the ancestors of the vast majority of people I know. Finally, what the eff do you want to "restore" America to? An America without feminism, without civil rights, without racial equality, without tolerance and acceptance of people whose religion, politics, and sexual identity differs from yours? That's not restoration, Mr. King. That's fear. And bullying. And cowardice. Your blatantly nationalist, racist tweet will, I hope, define you from this point forward. In the meantime, millions of concerned Americans will fight to shout down your bigoted beliefs. Restore America, my left buttock. Real Americans need to reclaim the idea of an accepting, inclusive America from troglodytes like you. Sir..
A few of my readers may agree with me. Along with several million of my countrymen, born from "other people's babies." 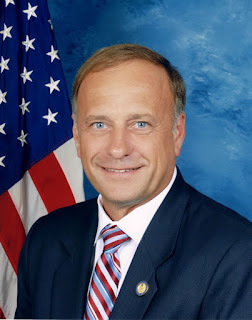 Rep. King should step out of his white enclave and try to assimilate.